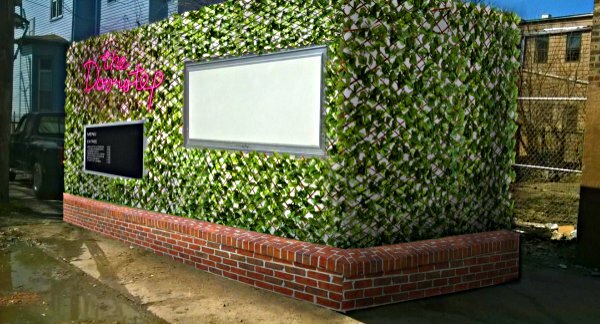 A Polish Triangle concessions applicant proposes a food truck covered in plastic vines. Sandwiches, ice cream, coffee and doughnuts will be on the menu as a mobile kitchen prepares to park on the Polish Triangle plaza this summer. Latent Design, the East Village architecture firm that manages city plaza concessions, has been negotiating with Rays Five Star, a mobile-kitchen startup. The Polish Triangle Coalition recommended the vendor for the Division-Ashland-Milwaukee plaza after reviewing applications May 25. Balkan pita-sandwich vendor Cevapcici will contine serving during Tuesdays on the Triangle after-work performances through Labor Day. The Zebek jazz quartet will perform June 7. The summer entertanment schedule features Latino Experimental Theater, the CSYO Steel Band and Adventure Stage Trailblazers. The food truck will take the name The Doorstep, reclaiming an arch Chicago Reader description of the Triangle in 2007. The concessionaire plans to wrap the trailer with simulated vines and brick, suggesting Wrigley Field's friendly confines. Tables and chairs will make the brick-paved plaza more inviting, while expanded trash cleanup will keep the dwindling pigeon population in check. The Doorstep plans to stay open from 6am to 8pm. Sandwiches will range to $9, said partner Aaron Feinhandler. The opening menu features banh mi, poor-boy, Cuban and caprese sandwiches, souvlaki and a breakfast sandwich. Food will be prepared nearby at Authentaco, 1141 N. Ashland Ave., a restaurant owned by Feinhandler's uncle, Felipe Caro. Feinhandler hopes to extend operation beyond the summer contract. The busy intersection draws an estimated 50,000 persons daily with its Blue Line stop, bus connections and the 99-apartment 1611 Division high-rise. Transit-oriented development will bring more apartments soon, including 275 units in the Wicker Park Connection complex. The East Village Association helped create the coalition in 2011, implementing community ideas gathered in the Wicker Park-Bucktown master plan and a Metropolitan Planning Council placemaking project. A coffee kiosk and events scored highly in the placemaking discussions and a 2014 survey.